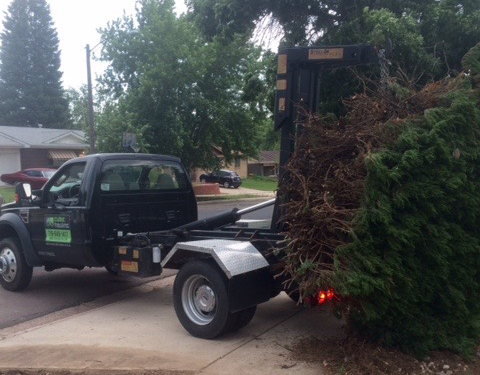 Dumpster Loading Colorado Springs | Need Help Loading Dumpster? Do you need help loading your dumpster rental? One popular option for our customers is called Load N’ Go, our dumpster loading service. Load N Go! Maybe you would like to hire our on-demand labor force to quickly load the dumpster for you and go. This service includes dumpster delivery and on-demand labor for debris loading, hauling, and disposal. Load N’ Go offers waste removal capabilities for the customer who does not need to rent a dumpster short or long term. The solution is a full service approach to both junk removal and recycling needs. With, Load N’ Go we temporarily provide use of the dumpster for loading. The customer has the choice to hire Cubic Hauling’s on-demand labor force or their own force to quickly load the dumpster and off we go. Under most circumstances the Load N’ Go option saves the customer money by not having to incur additional costs associated with rental. 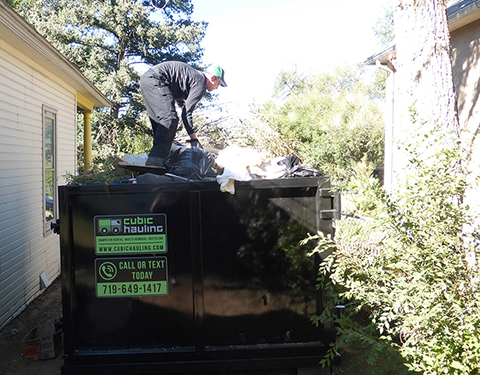 Cubic Hauling offers Dumpster Loading service in Colorado Springs and the surrounding metro areas. We serve commercial & residential customers for construction cleanup, junk removal, hauling, recycling, waste removal, and more. Call today at (719) 649-1417 for a free estimate!